After the post about the collaborative illustrations I did with our 4-year old daughter lit up, I was flooded with a ton of wonderful, inspiring ideas from people all over the world. Make some kid ones! Make some happier ones! Make one that looks like your daughter! And we did. And we had so much fun. The thing is, when we made them the first time, it’s not something that was very well-planned out. It happened initially by chance. It was, as Bob Ross said, a “happy accident.” We did it for fun, just because it was something we loved to do together. But sometimes I found myself trying very hard to draw faces that I thought people would like. 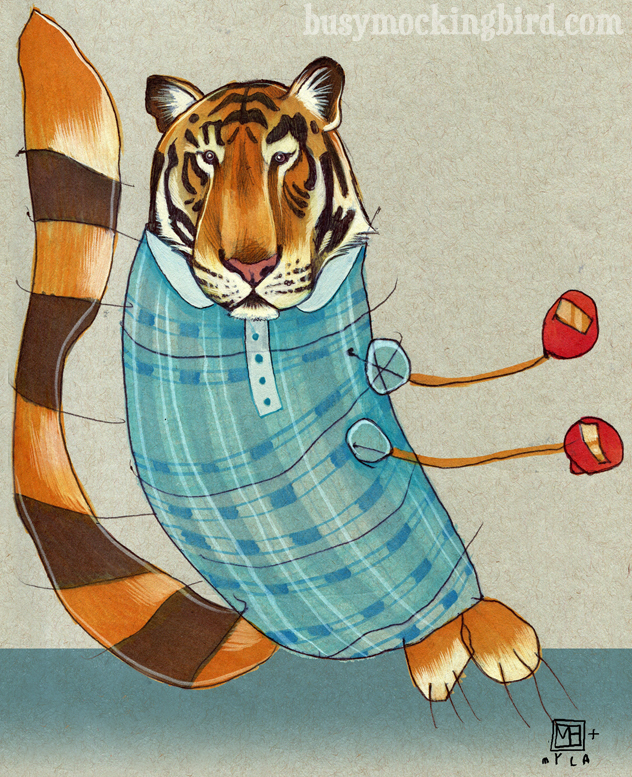 As an illustrator, I am VERY comfortable working with other peoples’ ideas. But when I try too hard on my own to make something I THINK someone will like (as opposed to what I just enjoy or would like to make FOR them), it always falls flat. So we laid off the heads for awhile, and took a little break. Until one day our daughter asked me if I could draw her some heads again. “This time can we draw an elephant one?” she asked. “Of course!” I said. …Man. She always has the best ideas. And so we did. And the life was back! And as much fun as we had with heads, I realized that the reason it was starting to feel so strange was that I was trying too hard to do something that I THOUGHT people wanted to see, as opposed to what I really REALLY enjoy doing with her. 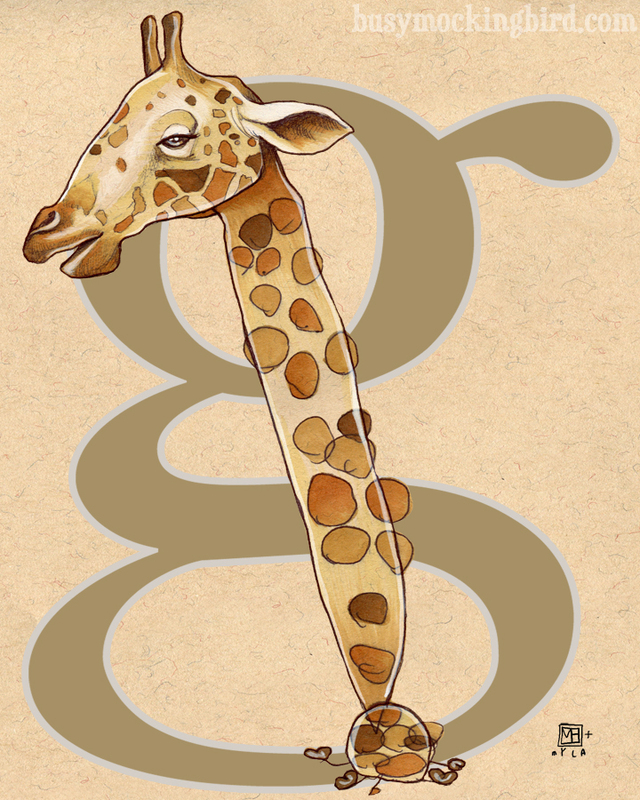 So we started simply–by drawing an animal for every letter of the alphabet. She would think carefully about what animal would be for each letter, and then focus intently when I’d give her an animal head to draw the body on. She had so much fun choosing animals for letters! I said, “maybe we could spell your name with them?” And we did. Then we kept going, beyond the alphabet, to whatever animals we both felt like doing. And you know what? I love them! And we had so much fun. It really would be nice if, once you learned a lesson, you never had to learn it again. I still constantly have to keep myself focused on letting go of my expectations; on enjoying what IS instead of what SHOULD or COULD be. Usually I find the best things come that way. Our head collaborations are not over. They’re still a very fun project we do together. But it’s good to mix it up sometimes, too. The lesson I keep learning and have to relearn again and again is that other peoples’ input is SUCH a great source of inspiration for me, but that trying TOO hard to create something specifically that other people might like is a dead end. DO WHAT YOU LOVE and do it with all the joy you have, just for the sheer joy of doing it, and people are bound to enjoy it and feel that love in it. And if they don’t…well, why do you care, as long as you’re happy? Because I liked them so much, I decided to put all the letters on RedBubble as prints. And some of the plain animals are there, too. If you like them too, or if you want to build your own name out of animals, that’s where they’ll be…! Totally entitled to your own reaction! These are all spectacular. 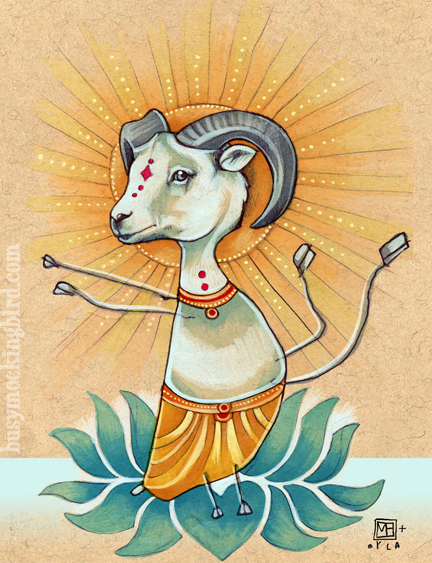 The Yoga Ram rocks! I love your (plural) work so much, as well as your advice. Also, the contest was a blast to take part in. Thanks for the inspiration and joy! I sent you last set of mother/child drawings to my daughter. She loved them (She has 4 boys). It was genius to think of this. I love it! Love your style ! I have a friend who comes once a week and we do art together. We each have one of your prints on our wall as inspiration. Sometimes my kids join in sometimes not. I wish you were in Canada, because shipping from the States is a killer :(. Love, love, love your collaborative efforts. You have an artist in the making! We have the one with all the animals. You mean with letters too? That might be fun! You are both truly amazing. I LOVE these. It’s so great you and your daughter have something like this to share. 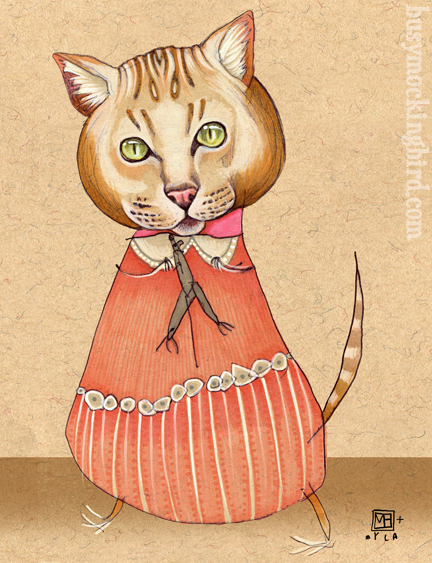 I hope I have this kind of inspiration when I have a little ‘un itching for a project! Mica Angela Hendricks is surely one of the most delightful moms I’ve seen. I got hooked to her blog since I came to see this post https://busymockingbird.com/2013/08/27/collaborating-with-a-4-year-old/ and have immensely enjoyed every single project she has posted about. And of course what wonderful drawings! I love it how you reiterate the plain and simple lesson of letting the magic happen by just doing what you love! Reminds me time and again of how fulfilling life really is if lived simply and children are the best reminders of that. Salute to you and your daughter for this joyful collaboration! This has hit home – I’m a writer, struggling at the moment with ‘voice’. I need to rediscover my joy in wordsmithery, and put to one side what I think I should be writing to suit the market. Yes, that’s always difficult. As an illustrator, my JOB is to draw what people tell me to draw. I have sometimes gotten into the habit of not wanting to draw unless it’s FOR something, which is ridiculous, and probably why drawing with my daughter has been so fun and exciting for me. It exists simply out of the fun of creating. So fun, I was picturing our grand’s name with these animals. Love them. So witty and fun. I kept picturing our grand’s name in these animals. Just purchased greeting cards to send to all of the littles in the family, okay, I’ll admit it, and a couple with my initial! I love these images! Make me so happy to see them. I’m imagining myself collaborating with my grand in a few years. These are just absolutely awesome! I love the alphabet idea and spelling her name. Great collaborations once again! Oh my goodness, these are so fun! How about doing an alphabet book with them? Thank you! We’re looking into publishers. We’ve had nibbles, but no bites yet! Just found your blog and I LOVE these! My mother’s an art teacher and I have great memories of drawing with her as a child. 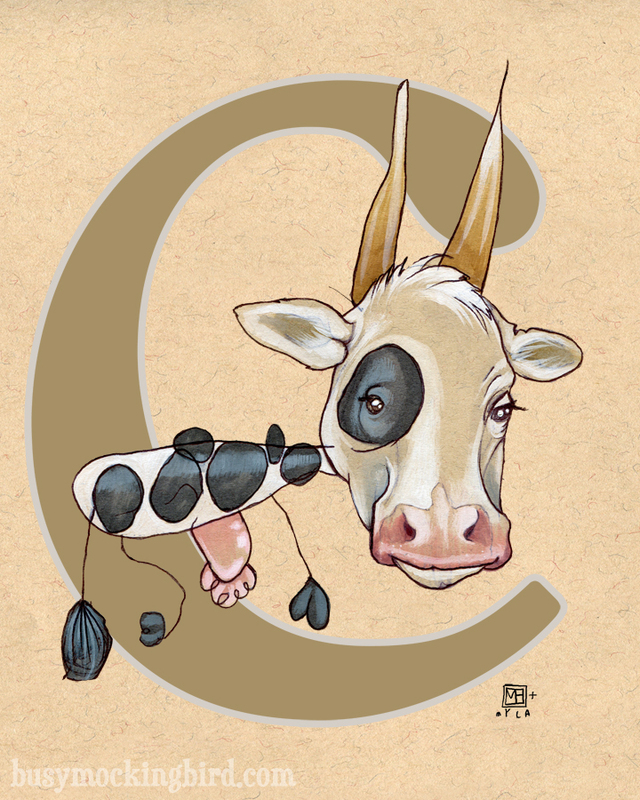 If you decide to just go ahead and self publish an alphabet book (which you should! ), it’s pretty easy. I just made one from my wordpress blog using blurb. It’s not the greatest layout software (somewhat limited choices) BUT it was simple and the finished print quality is great. And you can sell it off their website. And from the comments I’m sure folks would buy one!! Thank you for the suggestion! I’ve used Blurb before–it was very easy! The problem I ran into was that even before markup, the book was VERY expensive, and I only marked it up by one dollar. Ah well! But still, might be an option! Thanks so much! I love this! I loved your original post as well when you first did this with your daughter. 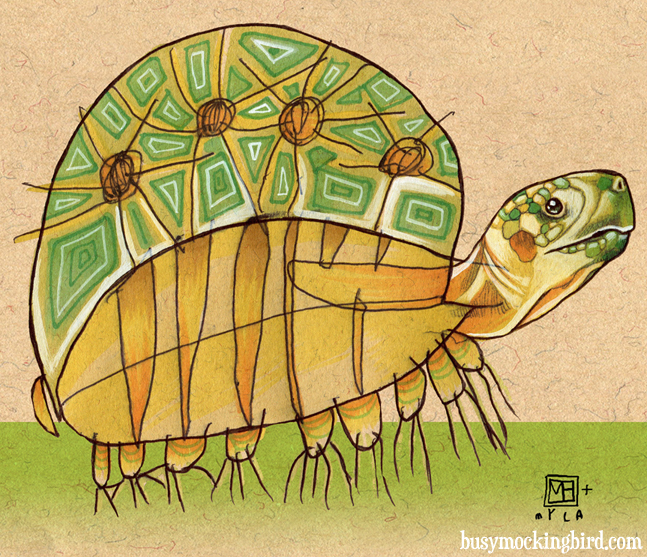 Would you ever consider illustrating a wordless picture book with your daughter? I think the combination of yours and her artwork would make for a very unique book that could appeal in a (semi familiar?) way to children that no other picture books currently do. Wordless picture books are all about the illustrations and your style would certainly stand out among anything else out there, particularly for its originality and the method of the books development/construction. I’m currently trying to launch a wordless picture book platform as an app for the ipad, take a look at the link below and if you’re interested in perhaps working together or just talking further please feel free to get in touch. What a beautiful kickstarter idea! If you’d like to contact me at busymockingbird@gmail.com, I’d love to talk more about it–or at least share your idea online! Wow I love these too. Those would be absolutely awesome kids puzzles as well if they were laminated onto the wood block puzzles. You know the old style puzzle block where you match the shape to the creature. You could even have a miniature scene of where that creature might live in each hole lol, just for the fun of it. Either way those are very fun. I absolutely love these. Such a great idea, and with awesome results! 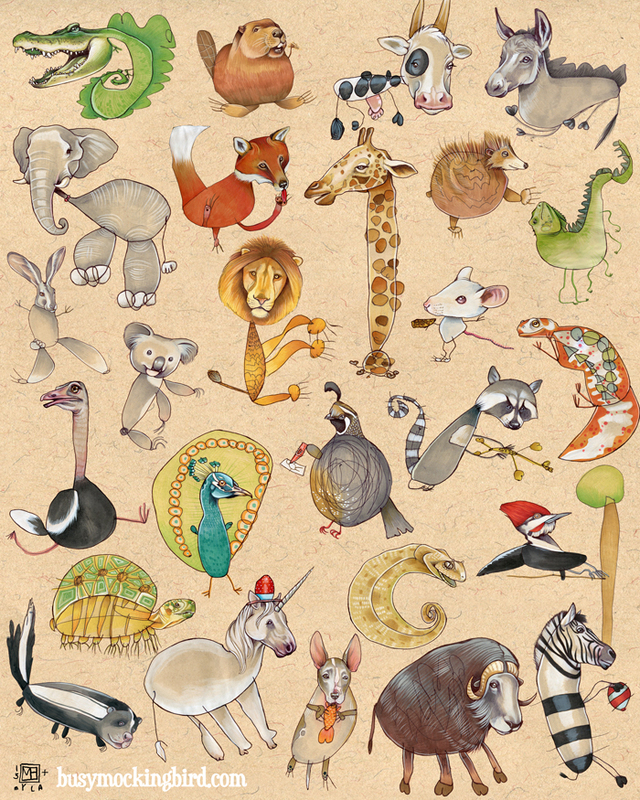 I would love to buy the animal alphabet image my boys’ room. Do you have it for sale in your shop? I didn’t see it. Love your work! ! ! Oh lovely! 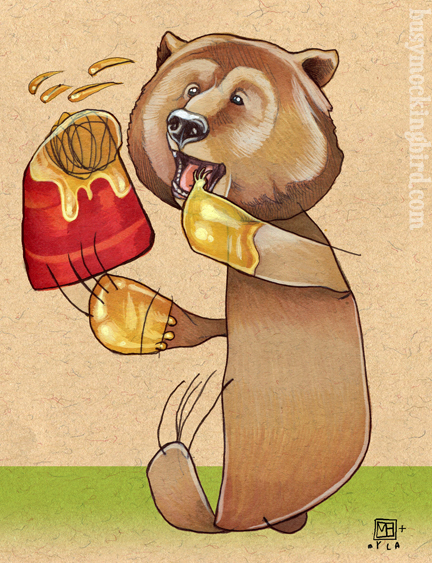 The animals are exclusively at RedBubble (http://www.redbubble.com/people/busymockingbird/works/11116655-animal-abcs). I hope they love it! I thoroughly enjoy looking at your work with your daughter and appreciate it as a teacher, artist, and parent. Wish I had thought of this when my girls were young. Do you use colored pencils? Your color is so vibrant and the details are just beautiful! Thank you! I don’t usually use colored pencils. 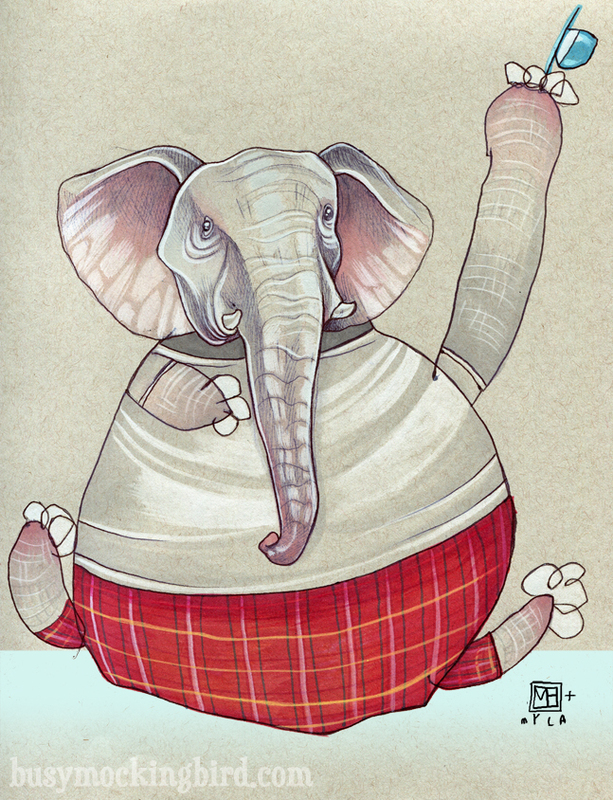 They’re drawn in ballpoint pen, then colored in marker and either acrylic or watercolor. Thanks so much!